New Winter 2018: Close your eyes and you can almost smell the delicious, soothing aroma emanating from this upscale cup of Joe! 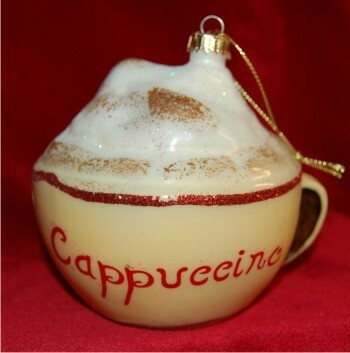 The cup of cappuccino Christmas ornament features a frothy mug of the sweetest stuff and the word cappuccino painted on in a stylish font. It commemorates the drink which originated in Italy in the 17th century among the Capuchin order of monks and nuns. These friends and family ornaments personalized in the artist's details feature enough glitter to sparkle wherever they are displayed and will remind the recipient of your friendship throughout the holiday season. Celebrate cups of cap enjoyed together with the glass cappuccino cup Christmas ornament in all its delicious style. For a friend's b-day Dec 16, 2014 Loren Q.